This is an update to the ‘Package Manager 0.9 – Installer’ NOT ‘Package Manager’ to make it a little safer by putting in some measures to avoid accidental end-user errors when installing. Package Manager is a replacement for the standard ★ Install Package Files option under ‘Game’ in the XMB for both 3.41 and 3.55 firmware. It allows for the install and deletion of .pkg files from ‘dev_hdd0/packages’, ‘dev_usb/packages’ and the standard ‘★ Install Package Files’ locations. In addition to this, your downloaded PSN content will appear under this menu instead of cluttering your ‘Game’ menu with uninstalled content. 1: Download the ‘Package Manager 0.9 – Installer 1.1′ package and install it on your PS3. 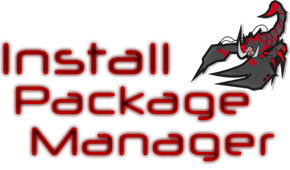 2: Run ‘Package Manager 0.9 – Installer 1.1′ and choose your option. 3: The installer will AUTO EXIT when it is finished. IMPORTANT NOTE: It can, in some circumstances take upto a few minutes on older PHAT 256mb NAND PS3′s.. BE PATIENT. The ‘dev_hdd0/packages’ folder is created automaticly when you choose one of the above install options but if you delete it you can use the below option to create it again. NOTE: ‘Package Manager 0.9 – Installer’ can be uninstalled once you have installed Package Manager. Navigate to ‘Game’ in your XMB and click on ★ Package Manager (It will be where ★ Install Package Files used to be). You will find three options. NOTE: The ‘Install All Packages’ is only available by pressing the TRIANGLE button when the ‘Standard Package Location’ option is highlighted because the PS3 will only install ALL packages from the root of a storage device as of the moment. NOTE: Any files that you have ‘Unlinked’ WON’T disappear from the XMB until you exit the directory!! TODO: The delete feature while 100% working still needs a little work on the appearance (icons need fixing etc..) and maybe have a look at implimenting a Storage Device<>PS3 transfer feature. BIG THANKS to Devil303 for the small line of code that assisted with the delete function..